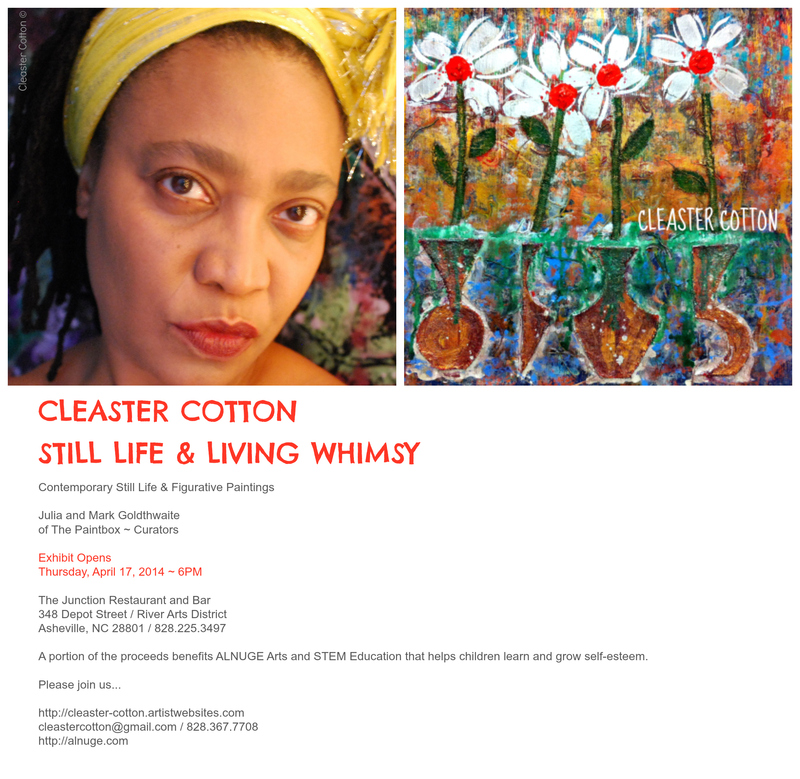 Cleaster Cotton Debuts New Art Exhibit! Here she goes again! The female Romare Bearden is who I call her. Cleaster Cotton is in a word; brilliant. She embraces the form of art completely and leaves you breathless and in awe of what the world really is and how we are all one with nature. Her commitment to helping children with her invention of the ALNUGE program is the bow on top of it. She is definitely in her time and is debuting a new exhibit entitled, ‘Living Whimsy’. The place to be is at the Junction in Asheville, North Carolina. But if you cannot make it, I am providing the websites where you can learn more about this wonderful artist and BUY her art and support her cause. Her cause is our cause. Our children are our future!! Support Artist and the art they create! This entry was posted in Asheville Arts and Pink Dog, Cleaster Cotton Artist and tagged Art, artist, Cleaster Cotton Artist, Living Whimsy, Romare Bearden, The Junction in Asheville. Bookmark the permalink.